Why OMSB planted? Autumn feed gap, all year feed stability and feed reserve. What grazing and pasture benefits have been observed? When saltbush started, changed to Time controlled Grazing, more ground cover now, quality of feed is much better. There has been a big increase in carrying capacity. 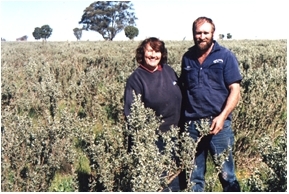 (in a good season lucerne carrying capacity equals that of saltbush in an ordinary season). Less weeds and a lot less work. What financial benefits have been observed? No feed been bought since starting with the saltbush. We are now having a much lower vegetable matter in our wool and a higher yield. We now run more stock all year and do it comfortably. Biggest OMSB impact? Very little water runs off the saltbush country, better water cycle plus pasture production is up on the other country. Where saltbush sown on scald land the grass feed is back. Now do not need lick blocks for the stock and animals are healthier. Any problems with OSB? Establishment. Care needs to be taken. Good advice is needed. Do you / if you had a salinity problem, do you think OMSB would help with controlling deep drainage and/or lowering the water table? Certainly would. Would you like to increase your area sown to OMSB? Yes, up to 25%. Of our area. Then possibly even more. What limits your planting of a larger area? Cost.